Oppo F3 RED Edition looms. Oppo F3 Red Edition is pegged to be released this weekend, August 12, alongside the opening of Oppo's newest concept store in SM Aura Premier. 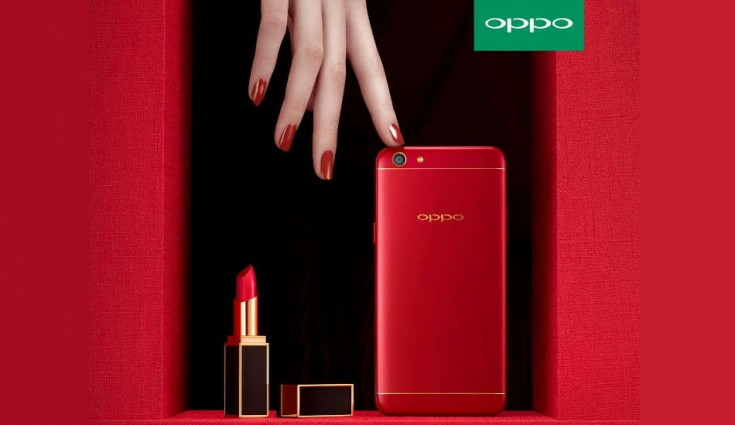 The handset will be donning a new red paint-job which is expected to give synergy to the already popular Oppo F3. The handset is expected to carry the same feature set just like the original Oppo F3 and the recently released Oppo F3 Sarah Geronimo Limited Edition. With that being said, The red Oppo F3 will tout a 5.5-inch Full HD IPS In-Cell display treated with Gorilla Glass. It would definitely tick with the same processor, the MediaTek MT6750T and Mali T860 GPU. The beefy 4GB of RAM will still give users smooth and solid multitasking performance. Of course, the flag-bearer feature, the dual-selfie camera, will still give the Oppo F3 Red Edition its edge among other selfie shooters in the market.